Once upon time people set pen to paper to express sentiments of passion, frustration, joy and sorrow. They made announcements about the milestones in their life and created records that captured moments in their lives, but with the advent of Ma Bell, cell phones, text messaging, emoticons (I could go on here), writing letters have become an archaic endeavor. Hardly anyone writes letters anymore, I would venture to bet that children don’t pass notes in class, which is where this American classic begins. Love Letters details the lives of Melissa Gardner and Andrew, “Andy”, Makepeace Ladd III. Melissa is an honest-to-a-fault, defiant, possibly bratty, young girl from money. Andy is a nice lad from a good, stable family with high morals who just happens to like to write letters. Over the course of 50 years Melissa and Andy honestly share their lives through letters, notes and announcement cards. They confide their hopes and regrets, victories and losses. Through their letters they share a life that is intimate and separate from the lives they lead with their families. And through all the disclosures they make over the years, they never share the one fact that binds them together – they love each other. They are soul mates who never really get the opportunity to share in life what they express in the pages of correspondence they write. Written by A. R. Gurney, Love Letters was a finalist for the Pulitzer Prize for Drama. It first opened at the New York Public Library in 1988. Following a successful seven month run off-Broadway at the Promenade Theatre, Love Letters premiered at the Edison Theatre on October 31, 1989 where it ran for 96 performances. Since its initial run on Broadway, A. R. Gurney’s play has seen many incarnations including a December 2007 benefit performance starring Elizabeth Taylor and James Earl Jones, which raised money for Taylor’s AIDS foundation. 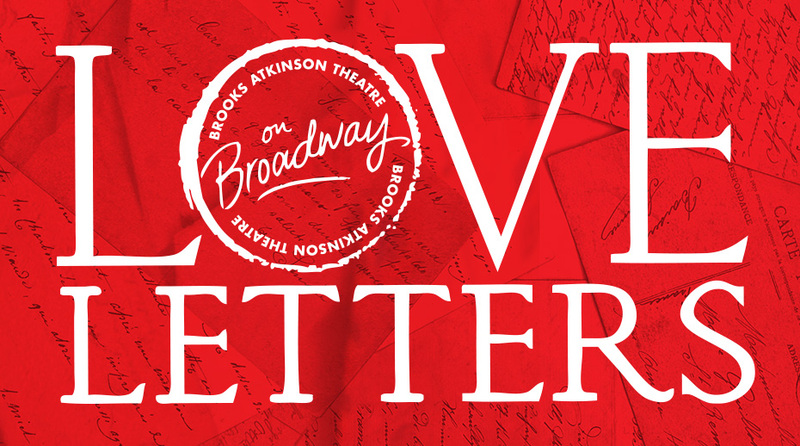 Love Letters has returned to Broadway opening September 18 at the Brooks Atkinson Theatre. Void of set and using epistolary form, the actors sit side by side as they recant Melissa and Andy’s complex relationship. The play is a favored among busy actors as it doesn’t require a lot of time for preparation and the lines don’t need to be memorized. As in past incarnations of the show, there is a rotating cast of stars. So far Hollywood legends Carol Burnett and Mia Farrow have played the role of Melissa opposite Brian Dennehy as Andy. Currently Alan Alda and Candice Bergen will take the stage for 35 performances ending their run on December 18, followed by Stacey Keach and Diana Rigg for 25 performances. 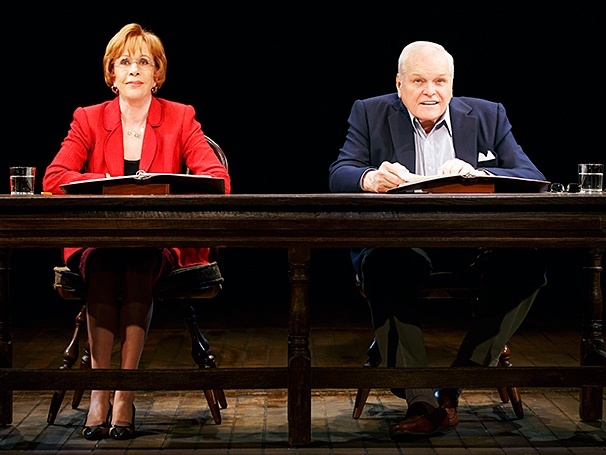 Love Letters ends its latest run the day after Valentine’s Day with Martin Sheen and Anjelica Houston taking on the roles of Andy and Melissa in show’s final 43 performances. I was fortunate to witness Carol Burnett and Brian Dennehy last week. I was totally enthralled. The highs, lows and ultimate heartbreak of Melissa and Andy’s story were recited so passionately by Burnett and Dennehy that it engulfed the stage like tight embrace. By the end of the play I was driven to tears. The beauty of Broadway is a show is just like the moon, it reincarnates itself every night. The audience is guaranteed to see a performance that is different from the night before, slight changes in gestures or cadence happens as the actors dive deeper into their characters. What makes Love Letters so special is this promise will be delivered to the audience double fold as the show rotates the cast. Love Letters is a stripped down production that gets straight to the heart of amore and unrequited affection, feelings that we have all experienced a time, or two, in our lives. It’s a brilliant show and a must see. Just be sure you bring some Kleenex…you might need it.